Scott McLaughlin on his way to breaking the lap record at bathurst. 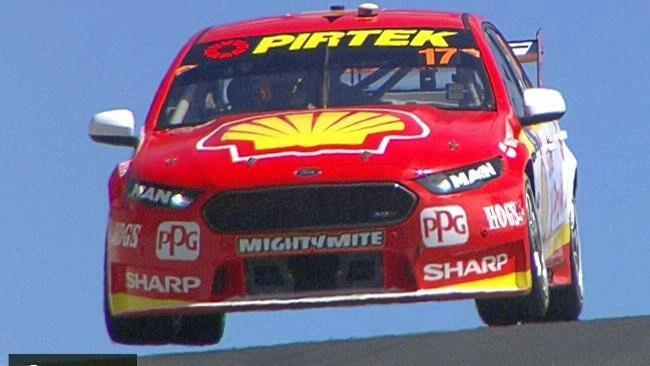 SCOTT McLaughlin didn't just batter the Supercars lap record at Mount Panorama - he annihilated it. The championship leader hacked chunks out of it across three separate assaults during Practice 5 for the Bathurst 1000. By the time he was done, it stood at 2m04.1470s, almost eight tenths of a second faster than Jamie Whincup's previous mark set back in 2015. To put that in perspective, had they started their laps at the same time, 2005 Whincup would have been 38 metres behind as McLaughlin was crossing the line. Along with the lap record - and the first 180km/h average lap in a Supercar around the Mountain - McLaughlin also held a half-second margin over his nearest challenger. "That was awesome. I'm pretty blown away to be honest. Nice to have the tyres to be able to do it," McLaughlin said. "Not a bad feeling, that's for sure." An even quicker lap was within his grasp on that third and final flier, having a taily moment coming out of The Chase. His ideal time, composed of his best sectors from across the session, sits at a mouth-watering 2m03.97s. "The first two sets of tyres I was too twitchy, put the last set on it was a bit better and just made a mistake at the second last corner," he said. "You've got to do the lap, but I'll take a 4-1 any day - but I tell you what, you're holding on." The reaction in the Shell V-Power Racing Team garage was one of shock and joy. Race engineer Ludo Lacroix was clapping and hopping up and down on his chair with glee. Elsewhere in pit lane was a sea of admiration and long faces, knowing that McLaughlin's speed throughout the 2017 season has translated to the biggest race of the year. Last year we talked about the 'fives' club. This year it's all about the 'fours'. The first 10 cars were inside the 2m04s bracket, with the first six also under Whincup's old lap record. Interestingly, none of the 10 cars hailed from the Red Bull garage. Whincup and teammate Shane van Gisbergen sat 14th and 15th at the end of the session, not appearing to get involved in the pursuit of fast times on new tyres. Record-breaking aside, the session was the least eventful of the weekend so far and ran without interruption.